The president of Tunisia’s Ennahdha party, Rached Ghannouchi, argues that the solution to extremism is more (not less) freedom and democracy, along with more moderate religious teachings. Ennahda has long felt an especially strong kinship with Turkey’s AKP, which has seen as representing a combination of piety, prosperity, and democratic credibility. How might their relationship be affected by the AKP's more recent authoritarian turn? The upheavals that have been shaking the Arab-Muslim world are revolutions in discourse as well as in the streets. Arabs are using not only traditional and religious vocabularies, but also a new set of expressions that are modern and represent popular aspirations. A powerful “salafist” public norm has taken root in the Arab world, becoming the main symbol of resistance to Westernization. At the same time, however, new cultural forces in the private domain are promoting a dynamic of secularization. The 2009 vote for the presidency and local councils was marred by fraud, provoking a political crisis and casting a deep shadow over upcoming parliamentary elections. The Afghan experience calls into question whether voting should occur before other essential reforms are in place. Although many Iraqi parties continue to be organized along religious or ethnic lines, both the tone and the results of the 2010 parliamentary election campaign show that most Iraqi voters prefer a broader national agenda over narrow sectarian appeals. A new look at the World Values Survey data reveals how the Muslim world’s religious context affects individual Muslims’ attitudes toward democracy. Indonesia is widely lauded as a democratic success story for rolling back the military, keeping radical Islam in check, and institutionalizing democratic freedoms. But this success has had costs in terms of democratic quality. Those who warn against efforts to promote free elections in Muslim-majority countries often point to the threat posed by Islamic parties that stand ready to use democracy against itself. But what does the record really show regarding the ability of Islamic parties to win over Muslim voters? Iran’s massive protest movement against June’s electoral coup is now moving into a new phase. What are its prospects? The Islamic Republic is struggling, with the Revolutionary Guard Corps more and more the only thing propping it up. When students and other rights activists decided to seize a tactical opening that the regime cynically offered them during the 2009 campaign, they were making a choice that was even more fateful than they knew. After a nearly two-year interlude of authoritarian rule, Bangladeshis voted decisively for democracy, a secular approach to politics, and the center-left. The challenge now is to show that parliamentary democracy can deliver stability and socioeconomic progress. Legislative elections in the Middle East often become contests over patronage and wind up reinforcing authoritarian regimes. Since its founding out of the partition of British India in 1947, Pakistan has labored in the shadow of critical choices made at that time. The rise of Islamist parties poses new challenges to efforts to understand the relationship between Islam and democracy. A diverse group of authors investigates this new phenomenon and its implications for the future of democracy in the Middle East. Islamist Parties and Democracy: Are They Democrats? Does It Matter? Islamist Parties and Democracy: A Boon or a Bane for Democracy? The program of carefully controlled reform-from-above that King Mohamed VI began almost a decade ago may now have reached an impasse amid signs of growing disaffection. The most important aspects of Morocco's September 2007 parliamentary election may have been things that did not happen: The Islamists did not win, and many citizens either did not vote or spoiled their ballots. Events surrounding Turkey's 2007 elections reveal a country with a vibrantly democratic political sphere and a society badly split over the role of Islam in national life. Findings from the Arab Barometer say little about whether there are likely to be transitions to democracy in the Arab world in the years ahead, but they do offer evidence that citizens' attitudes and values are not the reason that authoritarianism has persisted. About two-thirds of the world's Muslims live under governments chosen through competitive elections. The remaining third lives mostly in the Arab world, a region that poses the hardest challenges for democratization. Much has been achieved both in the war against the Taliban and in the larger struggle to create a democratic Afghanistan, but dire problems remain. The desire for freedom and self-government is written in human hearts everywhere; in this there can be no "clash of civilizations." Claims that Islam is inherently hostile to democracy represent an unwarranted surrender to fundamentalist arguments; we should engage with a broad spectrum of Muslim groups, but without compromising our commitment to freedom and democracy. By giving Hamas a parliamentary majority, Palestinian voters were neither endorsing extremism nor rejecting the peace process. Other Palestinian institutions have the potential to restrain Hamas, but there is a risk that it will turn to Iran or Syria for help. January’s remarkably free and fair parliamentary elections broke the PLO’s longstanding monopoly over Palestinian politics. Given Fatah’s disarray and the difficulties facing Hamas, there is now a window of opportunity for a third and avowedly liberal-democratic option to emerge. Contemporary liberal democracies, especially in Western Europe, face a major challenge in integrating Muslim immigrants as citizens of pluralistic societies. Getting to Arab Democracy: What Do Iraqis Want? There is a widespread desire for democracy among the Iraqi public, but when it comes to the roles of religion, ethnicity, and gender equality in Iraq's new democracy, attitudes are more varied. Whether ethnic, sectarian, or some combination of the two, communalsim is one of the massive realities of Middle Eastern life and politics. It is usually seen as an obstacle to democracy, but need that always be the case? A review of The Universal Hunger for Liberty: Why the Clash of Civilizations Is Not Inevitable. By Michael Novak. The May 2005 presidential election capped a process of conservative reentrenchment, but with a surprising populist twist. The June 2005 presidential ballot marks the culmination of the regime’s effort to dominate even the limited powers of the popularly elected offices. Given the unaccountable authority of the supreme leader, the Islamic Republic should be classified as a sultanistic regime. In such regimes, democratic change is more likely to come from nonviolent resistance than from internal reform. The election results reflect less what voters want than the ideological dynamics that shape the behavior of factions within the regime. Iran’s Peculiar Election: What Should “We” Do Now? The large number of nonvoters suggests that the movement for a free, internationally monitored referendum on the Islamic Republic’s constitution could gain widespread support. We must now work to make that so. Basic demographic and socioeconomic factors in Iran are favorable to democratization. The mullahs may hope to stave off democratic change by emulating the Chinese model, but this strategy is doomed to fail. Even after its successful elections, Iraq remains a divided society. Democracy did not create these divisions, but it could be the key to managing them. Turkey’s AKP: A Model “Muslim-Democratic” Party? Is the Islamic-oriented party that has ruled since 2002 really the harbinger of 'Muslim democracy,' or is it something more familiar in Turkish politics: a hierarchical group none too closely in touch with society and overly focused on one man? The lack of democracy in the Arab world is a problem that goes far beyond the absence of competitive elections. This lack must be traced not to religion or culture, but to adverse historical and geostrategic circumstances. The notion that the Muslim world as a whole does not suffer from a deficit in terms of competitive democracy is apealing, but rests on evidence and assumptions that cannot withstand critical scrutiny. As 2004 began, Afghanistan approved a new constitution that represents a key step forward in its political reconstruction. But it is not yet clear whether this new constitution will enable the country to surmount the many challenges that lie ahead. The stakes are enormous and the challenges are difficult, but a look at Iraq months after the toppling of Saddam Hussein reveals that, despite all the frustrating setbacks, grounds for cautious optimism remain. In the world’s most populous Muslim-majority country, a dense and pervasive network of moderate Muslim civil society organizations significantly reinforces political moderation and limiting the appeal of radical Islamism. Representatives of the Iraqi democratic opposition to Saddam Hussein assess what must be done to overcome the legacy of dictatorship and pave the way toward a free and democratic future for their country. There is an emerging current of enlightened thought in the Muslim world today, but it is all too often wrongly labeled and poorly understood. 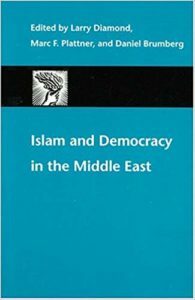 An “Islamic Reformation” is not a necessary condition for the emergence of democracy in the Muslim world; what is most needed is a political reformation. Liberal Islam remains marginal because it is politically suppressed; in truth, it represents the predominant political hopes of Muslims around the world. If they are to understand Islam authentically and to embrace the modern world freely, Muslims must take a new attitude toward their traditions of interpretation. The recent parliamentary victory of the AKP represents a new political course that holds enormous potential for Turkish democracy. How well-founded are Western concerns that the nascent parliaments of Kuwait, Qatar and Bahrain will be captured by antidemocratic Islamists and lead to the ‘Talibanization’ of the Gulf? While President Ali ABdallah Salih continues to call Yemen an ’emerging democracy,’ it more closely resembles athe autocracy of the pre-unification North. What do Muslims think about democracy? Although reliable evidence is hard to come by, survey data from Central Asia open a window on this matter of vital concern in the Muslim world and beyond. Talk about the Middle East and those who study it has become understandably heated. But we can learn more through a calm assessment of the achievements and weaknesses of this field. Is the field of Middle East studies as badly flawed as some critics charge? A fair-minded look at the last 10 or 15 years of research suggests otherwise. Middle Eastern autocracies rely ever more on repression of both their Islamist and secular critics, and therefore increasingly fear that any opening will be uncontrollable. Is there a way out? While many experts recommend postponing democratization pending the rise of a middle class, a directly political strategy may well be better. This region’s five republics have just lived through a remarkable first decade of independence that raises questions about “preconditions”-based theories of democratization. Although Islamist terror groups invoke a host of religious references, the real source of their ideas is not the Koran but rather Leninism, fascism, and other strains of twentieth-century thought that exalt totalitarian violence. After a failed democratic experiment in 1993-96 and two military coups, Niger successfully held free and fair elections in 1999. The next couple of years will be crucial to the long-term survival of democracy. The military regime of General Musharraf has been less repressive than many had feared, but there is little sign that it is overcoming the deep-seated problems that led to the failure of Pakistani democracy. Are all, or only some, of the world’s religious systems politically compatible with democracy? The “Fourth Generation” of Iranian intellectuals has a vital role to play in strengthening civil society and fostering democratization. Many observers regarded 1999 as a year of progress for democracy in the Arab world. There is reason to doubt, however, whether any meaningful change has really occurred.